This is an experimental list, and isn’t intended to be a balanced and flexible force like a generic infantry platoon. It’s radically different from most units you’d field in CoC and I think it’s interesting for that reason. Give it a go, your feedback would be much appreciated. Originally derived from garrison units occupying concrete pillboxes, the Fortified Regions were reinvented after the German invasion as mobile defensive units. When Soviet troops stopped advancing the Fortified “Regions” would move into the line and allow the infantry and tank divisions to move to the rear and rest. Each regiment-sized Fortified Region could hold the same section of the line as an infantry division. They were essentially an economy-of-force measure. In the hands of a determined crew the venerable Maxim could hold up a disproportionate number of the enemy. 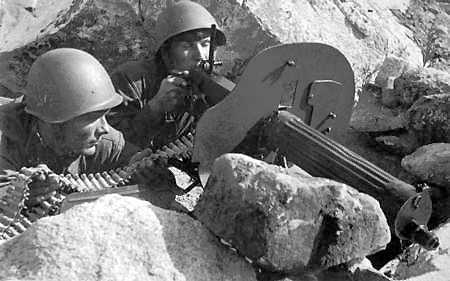 Exceptionally lean on manpower, the main fighting units were the Machine Gun Battalions. Each Machine Gun platoon had only 13 men manning four machine guns, but the tiny unit could call on lots of heavy weaponry and the engineers provided them with well fortified positions. Their job was to tie up much larger numbers of attacking troops until relief arrived. Their orders were to stand and die; they were allowed to advance if the enemy gave ground but not one inch of retreat was authorised. While the machine gun battalions had no riflemen themselves, infantry regiments were often attached to Fortified Regions. You might find the support option of infantry and scout squads makes your defence much more flexible. Not to mention that adding a single infantry squad nearly doubles your manpower! The small machine gun teams have good firepower, but can be fragile. The option to upgrade your Maxim positions to bunkers will greatly increase their survivability, but pick their fields of fire carefully so you don’t get outmanoeuvred. These tiny units had a high proportion of officers and NCOs, making them well-led. The elite option could represent a unit such as the 1st Guards Fortified Region. Do let me know if you try the list out. It’s a bit of an oddball list, I’d be interested to see if you thought it was fun to play with or against, or if it could use any tweaks to make it more playable. It’s not supposed to be particularly flexible, and the small size of the platoon means it can’t take a lot of punishment, so you’ll need to be crafty about how you play it. Good luck! Minimum range is listed as 24″ when you look in the table at the bottom of the document. I’ll make that a bit more explicit in the next version, which should be out very soon with some of the excellent suggestions I’ve had so far! Does the Command Post count as a field defense for the first 3 points of support spent? How did you factor the entrenched weapons with de coculator? Yes, that’s why they’re all one list higher than normal. No, I mean the entrenched Maxim in the main force, or the DP, how much costs in Coculator (DP is 6 points, if I recall correctly, and Maxim is 10 points). Ah, I get you now. They do get them cheaper than you would normally have to pay for them on the support list. Just like you get snipers and mortars much cheaper in your core platoon than you do on the support list, I basically bumped the whole platoon by 1 point of force rating for being dug in. Any more than that and it starts getting tricky to field a viable force. Sorry, I meant THE coculator (thinking in spanish, trying to write in english).